As a provider of endodontics, we perform procedures like root canals to save our patients' infected teeth. It may seem strange to say that endodontics can be comfortable but it actually can be. We are a laser dentistry office and we focus on using modern dental tools to perform common procedures. By changing the way that we do things we are able to treat our patients in a way that is significantly more comfortable and less invasive than in years past. For this reason, many of our local patients are switching from other dentist offices so that they can benefit from new laser technology. Lasers are not the things of Science Fiction. In fact, lasers are now much more common in the medical field. Lasers can perform all types of non-invasive surgeries and patients are benefiting from the decreased recovery times as a result. The same is true when it comes to dentistry. While many dentists are still using traditional metal dental tools, these tools are becoming obsolete. Thus, it is important to ask a dentist whether or not they use lasers in their regular dental cleanings. When we use lasers to perform endodontic procedures, we are able to target an incredibly small area of the tooth. This allows us to remove the infected tissue and bacteria without irritating the surrounding tissue or the gums. Metal dental tools, no matter the training and qualifications of a dentist, can lead to additional and unnecessary irritation. The metal dental tools still scrape the gums or an area of a nearby tooth. Laser energy is incredibly fine so this provides us with more control over the procedure. Anytime that an endodontics procedure is performed, there is always a risk of swelling and bleeding. By using lasers, we can help to reduce and control this. In fact, we can often stop the bleeding during the course of the procedure to reduce or eliminate the need for any gauze. Additionally, the decrease in swelling is going to help you be more comfortable both during and after the procedure. After experiencing a root canal, you may recall that it took you around a week to recover. In some cases, patients even have discomfort for up to 2 weeks. This recovery time is completely unnecessary when you visit our laser dentistry office. Since the procedure itself is less invasive and we are able to control/reduce swelling, we are also able to speed up the recovery time. Many of our patients report that they feel better the next day and that they can return to their dietary habits within only a few days. Our goal is to provide you with a treatment that is going to restore and save your tooth in a way that is comfortable. To experience the benefits of receiving an endodontics treatment from a laser dentistry office, call and schedule an examination. To experience the benefits of receiving an endodontics treatment from a laser dentistry office, call us and schedule an examination. 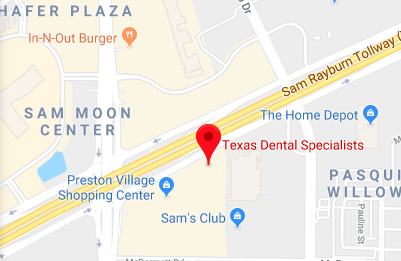 For more information on root canal treatment or to schedule an appointment with Texas Dental Specialists, request an appointment in our Plano dental office here: http://www.texasdentalspecialists.com. Or call us at (214) 619-6329.